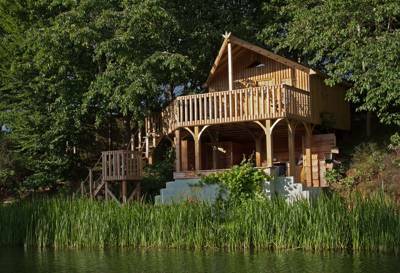 Ockeridge Rural Retreats is glamping at its very best, boasting an impressive 2 bedroom log cabin and amazing family sized Shepherds hut which can sleep up to 4 people in comfort and style. Boutique accommodation with a 5 star hotel feel. Egyptian cotton bed linen, Gilchrist & Soames toiletries, Hungarian duck down duvets all gives the feeling of sheer sophistication and style. 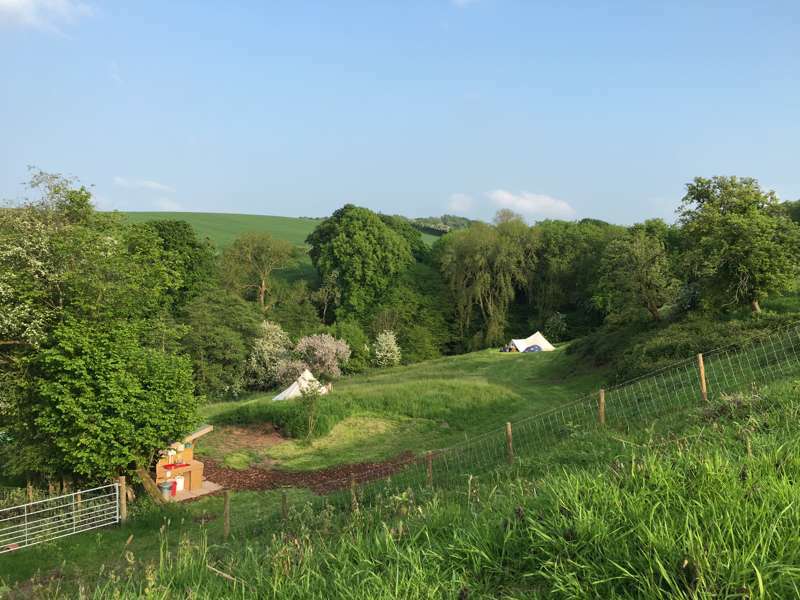 The glamping site is set in a 9-acre equestrian facility where you will experience these majestic creatures as they graze away in this tranquil setting. Unwind, relax and enjoy this brand new facility created with the sophisticated traveler in mind. Set on a country lane with magnificent views and access to fields and woodlands and yet only 6 miles from Worcester city centre. Walking, cycling, fishing, pony rides for kids all on your doorstep. Our Log cabin boasts a fully fitted kitchen, lounge/dining room, 1 king size bedroom, 1 children's bedroom with bunk beds, luxury bathroom, massive L shaped sofa. 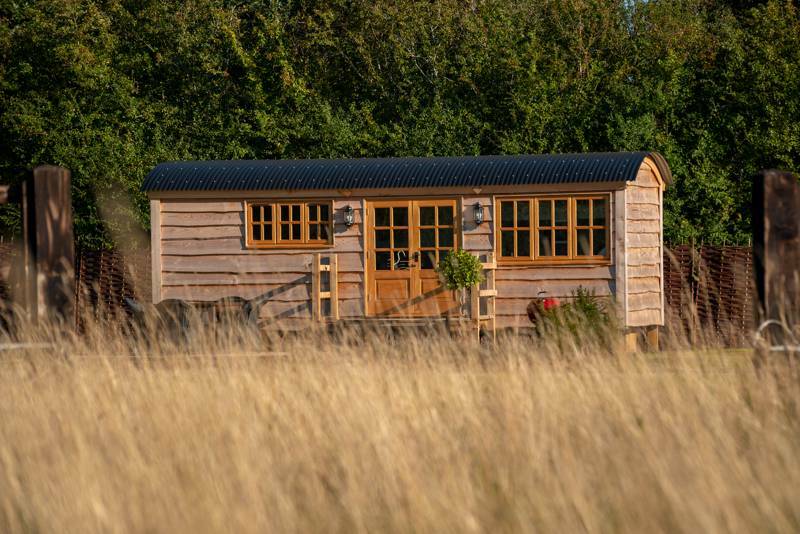 Our shepherds hut is far from normal and will exceed all your expectations. 24 feet long x 9 feet wide, king sized bed, 2 single bunk beds, kitchen, and luxury bathroom, smart TV, under floor heating. 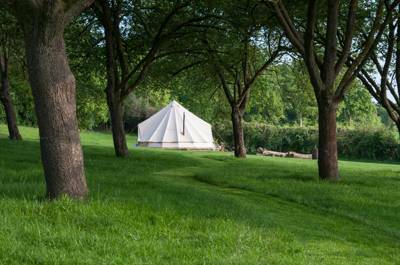 This is a little peace of heaven where you will escape in a magical environment. 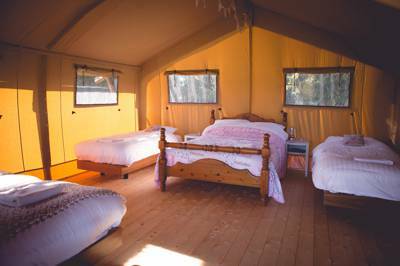 Uncompromising standards and attention to detail will ensure your stay with Ockeridge Rural Retreats is a memorable one. For latest availability and best prices for Ockeridge Rural Retreats, please use the Date Search above. The shepherd Retreat hut is ideal for couples and families and has under-floor heating and features a king-sized bed and 2 single bunks (bedding & towels provided), a breakfast table and chars, a kitchen with hobs, oven, fridge, sink, utensils, crockery and cutlery, a smart LED television, en suite bathroom with shower and an outdoor table with chairs. For something really unique there is even an outside roll top enamelled bath tub so you can stargaze whilst soaking your troubles away. 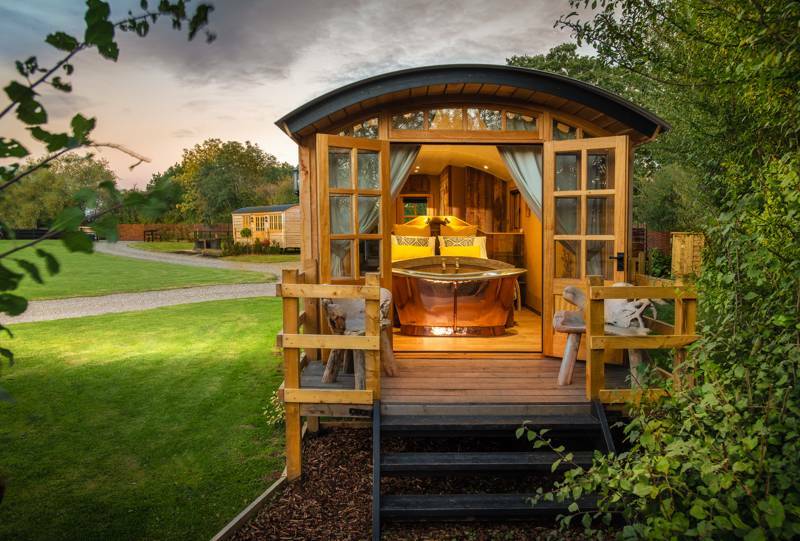 The Ashwood Shepherds Hut is for couples only has a Kingsized bed and a stunning copper bath tub at the end of the bed. A cozy log burner, underfloor heating and a full wet room with large shower and WC. Handmade kitchen and seating area make this a truly unforgettable experience. 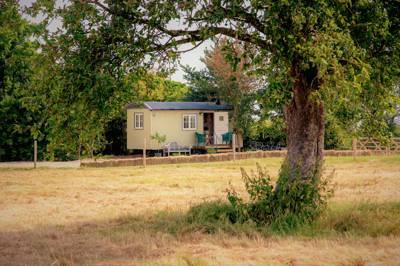 The Hillside View Shepherds hut also for couples only is new for 2019 and has a fold away double bed and fully equipped kitchen with full sized oven and fridge. A big shower room with WC and wash basin give you all the creature comforts of home together with a large seating and dinning area. A large decking area outside gives you amazing views of the Martley Hillside. It's just half a mile from Ockeridge Rural Retreats to the local fisheries (07398 176362; you can walk there easily) so bring your tackle if you're a keen angler. Witely Court (0370 333 1181), a vast, ruined Victorian mansion and once of the great country houses of England, is 2 miles away. A devastating fire in 1937 left it in the state you find today – undoubtedly one of the country’s most spectacular ruins and a real spectacle in its own right. It's 6 miles, meanwhile, to Worcester city centre, well known for its magnificent cathedral (01905 732900) and independent shops. National Trust-owned Greyfriars' House and Garden (01905 23571) is well worth a visit, as is the Worcester City Art Gallery & Museum (01905 25371) on rainy days. The small Tudor House Museum (01905 612309) is also fantastic. When the sun is shining, though, nothing bears getting outdoors and exploring the Malvern Hills. 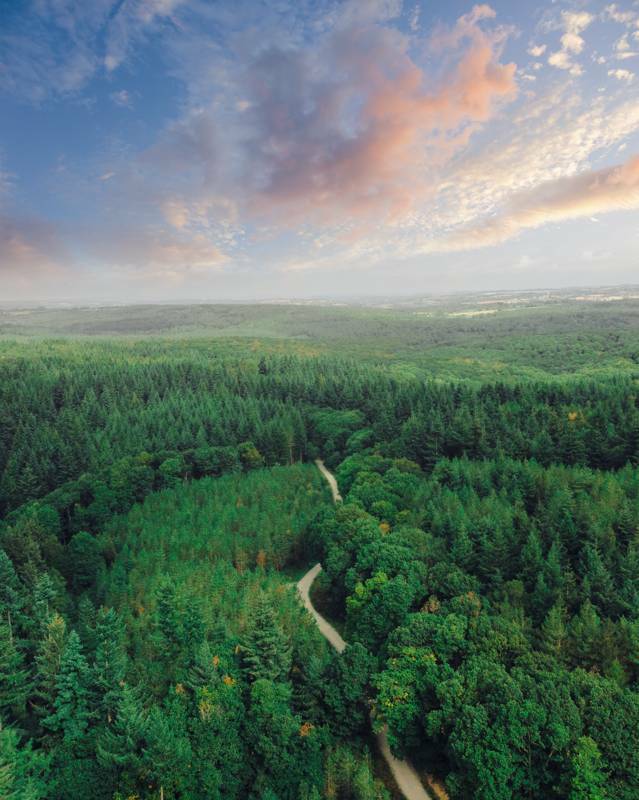 The designated Area of Outstanding Natural Beauty is just under 10 miles away and is renowned for mountain biking, along with miles of footpaths and hiking trails. For a more sedate way to take in the Worcestershire scenery, try The Severn Valley Railway (01299 401776), 8 miles away. The nearest pub is the Holt Fleet (01905 620286), 2½ miles away on the edge of the River severn. The Crown (01905 640408) in Hallow (5 miles), is a strikingly modern, gastro pub affair and can be walked to via country lanes allowing you to really explore the area. Leave the M5 Motorway at Junction 6. Take the A449 exit on the roundabout onto a dual carriageway, signposted to Kidderminster. At the first roundabout, take the third exit, still following the A449 to Kidderminster. Follow the carriageway for around 2 miles, and then take the left hand slip road to Ombersley. Go through Ombersley and, at the roundabout, turn left. Follow the road for 2 miles, go over Holt Bridge and at the mini roundabout go straight on. At the end of the road you will see the Red Lion pub in front of you, turn right onto the A443 sign posted to Tenbury. Follow the road for around ½-mile, then turn left onto Ockeridge Lane. 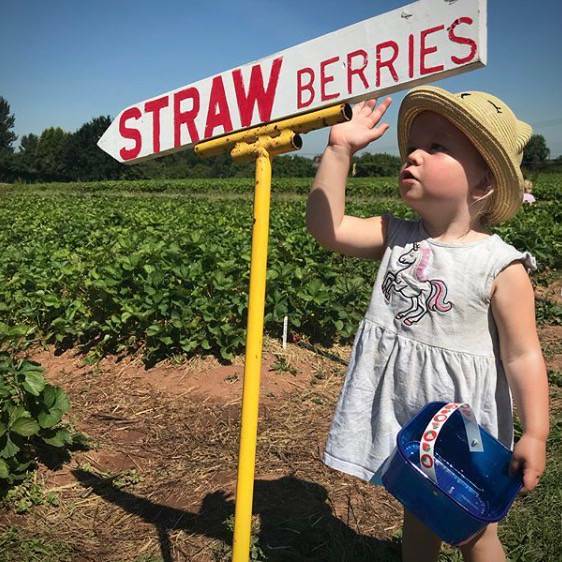 Follow the road for 1½ miles and, after you pass the first turing on your right into Well Lane, Ockeridge Rural Retreats' gated entrance is on your right hand side. The nearest railway stations are quite a distance away in Droitwich Spa (8 miles; 0845 748 4950) and in Worcester at Foregate Street (10 miles; 0845 748 4950). Taxis are available from both. 1 log cabin and 2 shepherd's hut.